Have you ever considered an investment strategy that allows you to value an asset, right down to the stock-specific level, with little or no knowledge of the company? Well, quantitative investment strategy may be your answer. With a relatively small amount of information, you can exploit a range of simple, profitable and persistent anomalies through quantitative techniques. The quants became very popular in the period up to mid-2007, but fell out of favour after. Too much capital had flooded into the area and many managers were victims of their own success. Rapid capital inflows eroded alpha over time and made it difficult for managers to trade when liquidity evaporated. But despite problems in the space, the basic factor tilts that quants use are STILL EFFECTIVE TODAY. It was the business model of the quants that failed, rather than the factor models. So which factors are most effective at adding value? Value is perhaps the most widely recognised, tested, and universally accepted quantitative factor tilt. The idea is to buy something that is cheap and sell something that is expensive. Cheapness is measured by looking at the price of the asset relative to its underlying fundamentals, such as book value per share, earnings per share, cash flow per share or dividend per share. The resulting ratios: Price/Book, Price/Earnings, Price/Cash-Flow, or Dividend Yield are widely published along with the share price and market capitalisation of the company. The first people to elaborate on the value factor and explore it thoroughly were Professors Eugene Fame and Ken French. They found that not only was the value premium highly persistent over time; but that it was prevalent across many countries as well (Value Versus Growth: The International Evidence). To this day, value is one of the most effective quantitative investment strategies as we can see from the graph below. It has averaged a return of around 4.7% per annum since 1927, which has not eroded over time. Value returns (HML) taken from the Ken R French website. No one knows why the value premium exists, but my theory is that cheap valuation is an expression of risk. In the fixed income world, investors regard “high yield” securities as high risk. A current example of this might be the high yield on offer for Greek government bonds. To the extent that the underlying entity doesn’t default, you pick up a value premium or higher yield from the security as compensation for the higher risk. Perhaps the next most recognised quantitative factor would be momentum. The idea behind momentum investing is simple: buy the things that are going up and sell things that are going down in price. Before attempting momentum investing, you must establish your measurement period and holding period. The measurement period is over what time you consider past performance, while the holding period is how long you will hold the security. 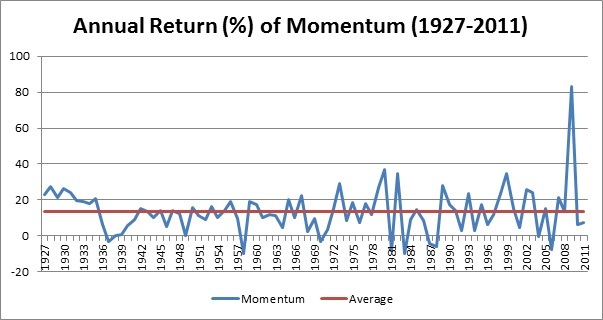 A typical momentum strategy would be to measure performance over the last 12 months and then hold for one month before turning over. The individuals who really popularised momentum investing are professors Narasimhan Jegadeesh and Sheridan Titman, with their seminal papers. Their initial work focussed on the United States equity market, but they soon realised the momentum premium was prevalent across international markets as well. Quantitative investing using the momentum tilt is highly effective in practice. Although, transaction costs are higher that value investing; portfolio turnover is not sufficient to eliminate the average profit of 13.5% per annum from this strategy. 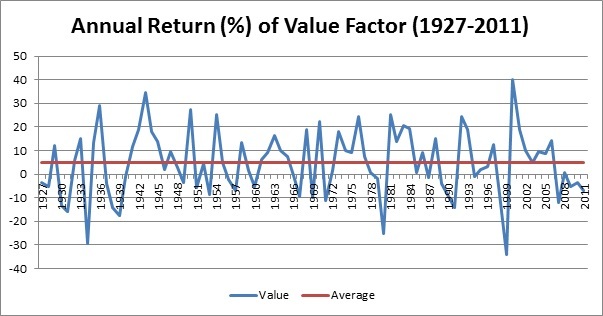 Note that volatility of the momentum factor is higher than that of value. Momentum (MOM) returns taken from the Ken R French website. Why does the momentum factor work? The academics disagree about this, but in my view the momentum premium is a by-product of economic cycles created by central banks. There is a strong sector level effect in the momentum premium, where whole industries or sectors tend to do well or badly for persistent periods of time. This suggests a foreign actor within the market and the most obvious source of that would be central bank monetary policy, which is itself highly cyclical in nature. The effectiveness of a quantitative investment strategy using value and momentum factors remain to this day. Not only is it effective across geographies and time periods, but also across asset classes. Whilst I am currently more focussed on getting the big asset allocation decisions correct, there is additional value to be added by optimising your strategy within the asset class. One of the best ways to do this is through a quantitative investment strategy.